Nearly 50 people from Guanajuato have arrived in Ashland to celebrate the 50th anniversary of our sister-city relationship. 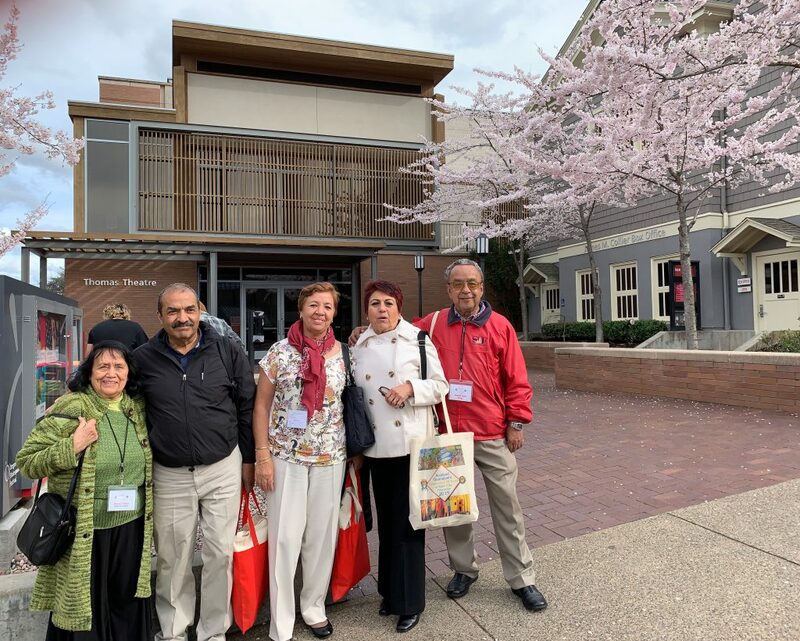 Today (April 5) was the first day of their six-day visit, which will include meals, tours, and other events sponsored by the Rotary Club, Southern Oregon University, Ashland Chamber of Commerce, Oregon Shakespeare Festival, churches, various business groups and local agencies, and the Amigo Club. If you see our visitors on the street, please give them a warm welcome—bienvenidos a Ashland! Señora Chela Tapp-Kocks, the force behind the sister-city relationship, with four of our visitors from Guanajuato—Dr. Miguel Covarubias, Marta Covarubias, Carmen Ortega, and Salvador Ortega. The photo was taken in front of the Thomas Theatre after guests viewed a performance of “Hairspray”, followed by a discussion with a bilingual actor.